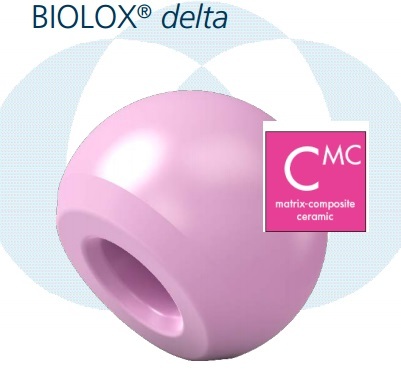 BIOLOX® delta is a zirconia-toughened, platelet-reinforced alumina ceramic, designed to incorporate the wear properties and stability of alumina with improved material strength and toughness and a distinctive color. BIOLOX delta material contains 82% of alumina, 17% tetragonal zirconia particles, 0.5% strontium aluminate and 0.5% chromium oxide. All values are approximate values by volume compositions. Improved burst strength compared to alumina ceramic heads2. 1. Liao, Y.-S., K. Greer, et al. “Effects of Head and Roughness on the Wear of 7.5 Mrad Crosslinked-Remelted UHMWPE Acetabular INserts.” Poster No 1901, 54th Annual Meeting of the Orthopaedic Research Society. 2.Rack, R. and H.G. Pfaff. “A New Ceramic Material for Orthopedics.” Proceedings of the 5th International CeramTec Symposium, G. Thieme Verlag, Stuttgart, 2000: 141-145.